Language and Demeanor in Police-Citizen Encounters offers an alternative explanation of police behavior that provides a significant departure from past and current studies of the police. This book is based on the analysis of talk that occurs between police officers and citizens during routine calls for service that the police receive and initiate. Author Philip Chong Ho Shon uses transcripts from actual conversations between the police and the public to demonstrate the tenuous link between peace and social disorder. 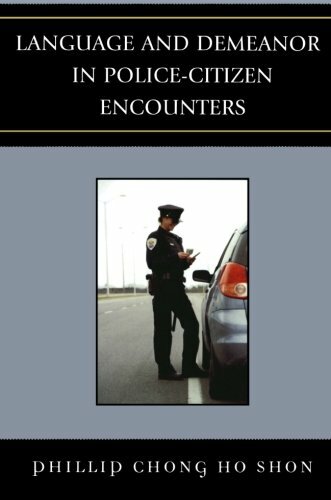 Language and Demeanor in Police-Citizen Encounters provides a practical and situated glimpse at the way police officers verbally exercise their coercive power during routinely occurring interactions with the public. View More In Criminal Law. If you have any questions about this product by Brand: University Press of America, contact us by completing and submitting the form below. If you are looking for a specif part number, please include it with your message.